The Lawyers Inc. plan enables the fee earning team which currently exists in your firm to remain together while re-structuring. The model helps your team to expand and become more profitable, while preserving your Firm’s name and reputation. Each firm re-structures as a ‘pod’ under the Lawyers Inc. umbrella. 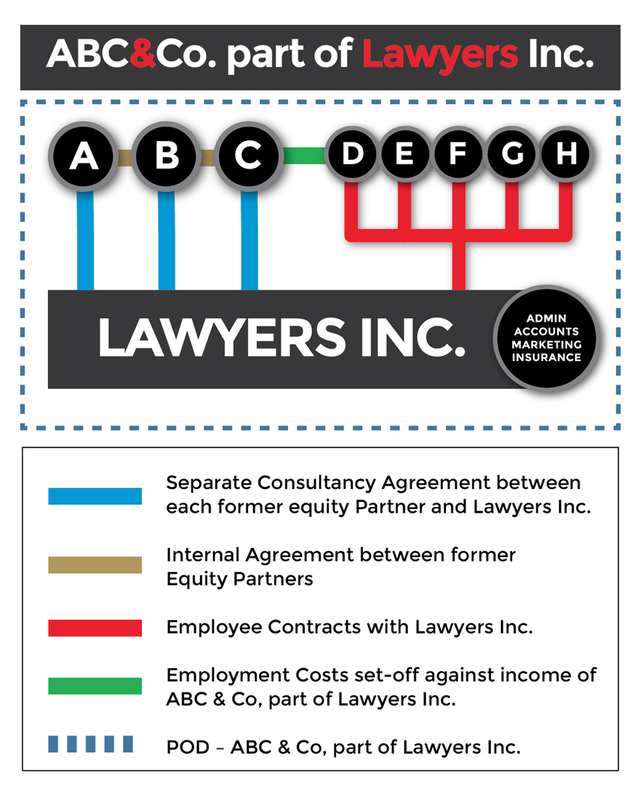 By joining Lawyers Inc. you and your current equity partners will share up to 80% of your future billing. In return, we provide all the back-up services and support for you to seamlessly continue to trade without all the burdens associated with running a law firm. This frees up your time to concentrate solely on the servicing of your clients’ needs and expanding the client base. The model’s flexibility encourages each pod to independently pursue a sustained program of growth, the pace of which, is determined by the members of the pod. 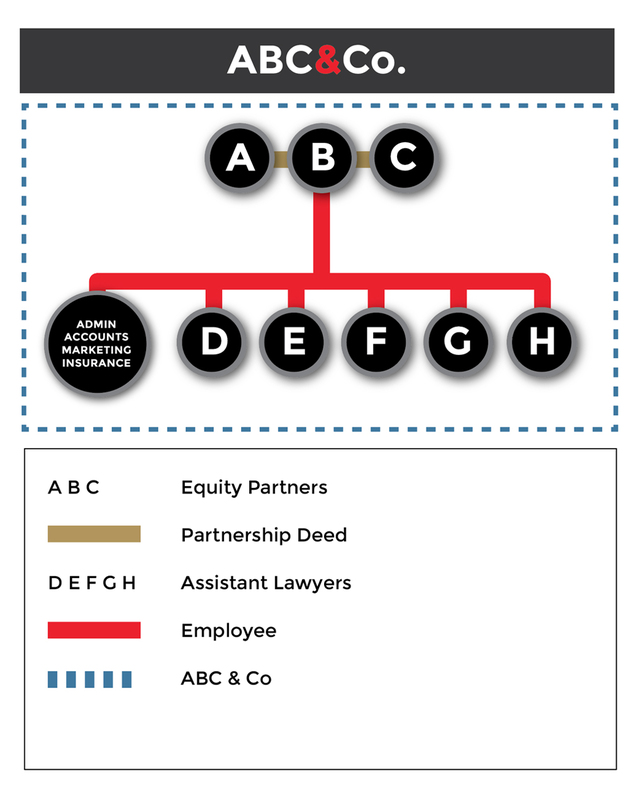 Let’s suppose, AB and C are the Equity Partners of A,B,C and C., and employ the assistant solicitors D,E,F,G,H. The Equity Partners decide to join Lawyers Inc. The second Contract, we call an Internal Agreement (IA), is an Agreement between the new companies A, B and C detailing how the gross fee income proceeds are to be divided between them. expenses including a laptop, digital dictation machine, practising certificate, scanner/printer and mobile phone (total average approximately £1,000 pa per lawyer). A Consultant may request Lawyers Inc. to retain the service of non-fee earning support staff such as a favourite PA or receptionist but that would be re-charged. Prior to the commencement date, all lawyers receive full training to use all the administrative, secretarial and IT back-up provided by Lawyers Inc. This ensures each lawyer is comfortable with any new software in their relevant discipline. Following execution of the contracts, ABC and Co. will reconstruct, triggering run-off cover. Thereafter, the new Pod, ABC and Co. part of Lawyers Inc. will seamlessly continue to practise under the auspices of Lawyers Inc. (the commencement date). In effect, the firm has successfully re-structured, becoming a new Pod. From the commencement date, all billing will automatically follow the procedures set out by Lawyers Inc. It is important to note that all the Consultants are paid monthly based on client bills paid. Lawyers Inc. will continue to pay your previous associate fee earners on the same basis as before. These will be then charged back on your monthly statements.